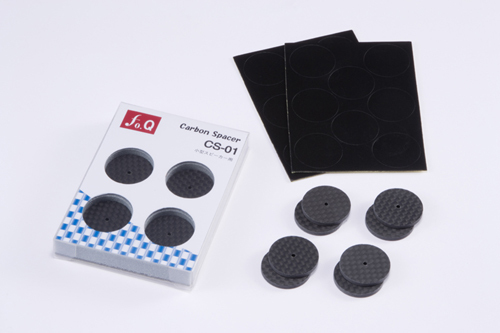 The CS-01 carbon spacer is the ultimate in spacers for use with speakers, featuring a cutting-edge material that combines organic polymer hybrid vibration-damping sheets and high-grade carbon fiber reinforced plastics. It effectively absorbs tiny unnecessary vibrations in the equipment, eliminating muddiness and distortion from the sound to produce a clear, translucent sound quality. The adhesive damping spacers provided as an accessory can be affixed in any preferred locations. In addition to damping vibrations, they also serve to keep equipment firmly in place. Copyright © 2013 fo.Q All Rights Reserved.